N26 has long been my favorite bank in Europe, and for good reason. Their user friendly app, low fees, useful integrations—like Transferwise—and their investment module puts them miles ahead of most of the competition. The fact that you don’t have to show up in a physical branch anywhere makes it an even sweeter deal—especially for the nomadic crowd. 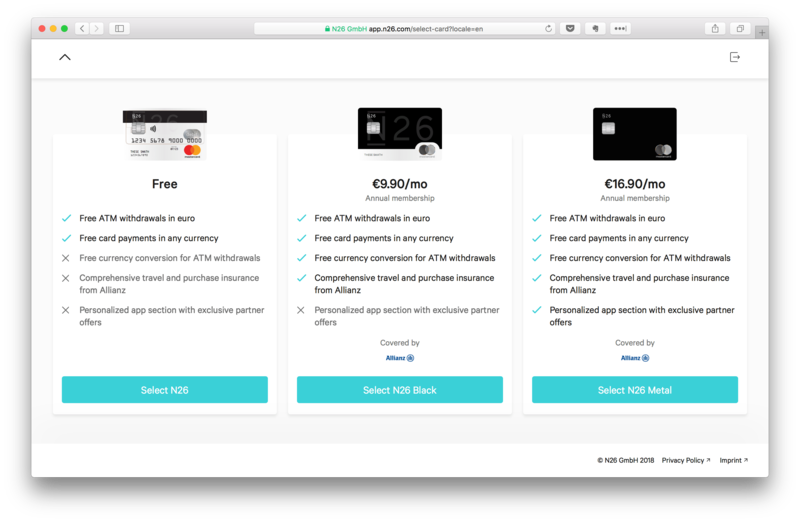 I’ve written extensively in the past on why I love N26 so much, so if you’re still not sold check out this article. Anyone can open a N26 Bank account, as long as they are resident in the EU or EEA. In order to open an account, you need a mailing address in one of the countries where N26 operates for them to send you your Mastercard. As of this writing, N26 operates in all the Eurozone countries, except Malta and Cyprus. That leaves Germany, Austria, Spain, Italy, Ireland, Slovakia, Greece, France, Belgium, Estonia, Finland, Latvia, Lithuania, Luxembourg, Netherlands, Portugal, and Slovenia. Recently, they made their EUR denominated accounts available in Norway, Sweden, Denmark, Poland, Iceland, and Liechtenstein. They are now also offering local GBP accounts to residents of the United Kingdom. They will also start offering local accounts in the United States in the first half of 2019. You also need a smartphone running iOS 9 or Android 5 or higher. The first and thirds steps are the same for everyone, but the second step varies depending on your nationality and residency. We’ll get back to that in a minute. No matter your residency and nationality, you start by filling out the N26 registration form. Just go here and click the Start registration button. The country you sign up with will determine the features and pricing for your N26 account “forever”, even if you move to another EU country at a later date. An optional promotional code. It’s not required, and as far as I know there are no ongoing N26 promotions available to the public. The only exception is if a friend gave you a referral code, then your friend will get a few euros for referring you (but you get nothing). I could have posted my code, but you don’t make anything from using it, so I don’t. But once you’ve signed up for N26, you can refer your own friends and make some extra cash. Finally you have to agree to their terms and conditions, and optionally opt in to product updates and some privacy settings. After you have confirmed your email, you can log in to your account and choose which N26 plan you want. If you’re unsure, just go with the regular N26 plan for now. You can always upgrade later. NOTE: If you select the Business plan you can not change to a personal plan later, so for most people I would not recommend it! The next step is confirming your identity. Whether you can do this through a selfie or video call in the N26 app in a matter of minutes, or if you have to visit a German post office, depends on your nationality, ID documents, and delivery address of your card. 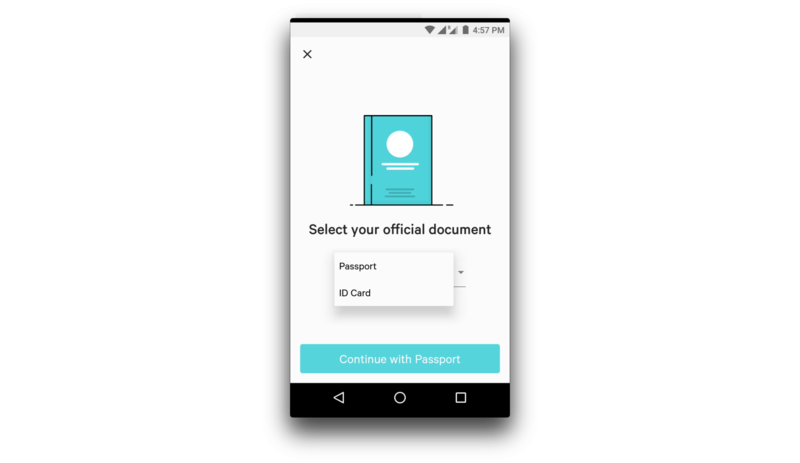 Assuming you don’t have a German address, the ID verification is super simple: You just need to take a selfie and a photo of your ID document with the N26 app. There are exceptions where an older passport, even from the mentioned countries, is not supported. That might be the case if it lacks biometric safety features—something most modern passports have. If you don’t hold any of the passports or ID cards listed above, your only option is to open an account with a German address and go to a German post office. After you have verified your email address, download the N26 app to your phone and log in. Make sure the lighting conditions are good so the pictures are clear. Make sure you have your passport or ID card (according to the list above) and follow the instructions in the app. It shouldn’t take more than a minute! Again, there are exceptions where an older passports without biometric features are unsupported. If you don’t hold any of the passports or ID cards listed above, don’t worry. Just skip ahead to the section about the PostIdent method. After you have completed the initial registration form, you’ll be instructed to download the Android or iOS app to complete the identity verification. Once you initiate the call, you will usually be connected to an agent without much delay. On some occasions you might have to wait a little bit, but rarely more than 5-10 minutes. Note that you can only do the video verification between 8 am and midnight German time. During the call you will be asked to verify a few details from your registration form, as well as typing in a code sent to the phone number you registered with. You will also be asked to show your ID document to the camera in different angles so that the agent can verify that it’s legit. Note that the call will take place within the N26 app, not the separate IDnow app mentioned in the video—but it still follows the same format. If your delivery address is in Germany and you don’t have one of the ID documents listed above, your only remaining ID verification option is the PostIdent method. It is really only practical if you’re living in Germany or are planning to visit. To be honest, visiting a city like Berlin for a while is not such a bad thing, anyway. At least in the spring or summer. It’s one of the most creative cities in Europe, and still relatively affordable. And I’m sure other parts of Germany is worth visiting as well. Oktoberfest, anyone? Choose either to do the ID verification with your passport or ID card (if supported, see the list below). Click the button to request the PostIdent coupon. Print out the PostIdent coupon you received per email. 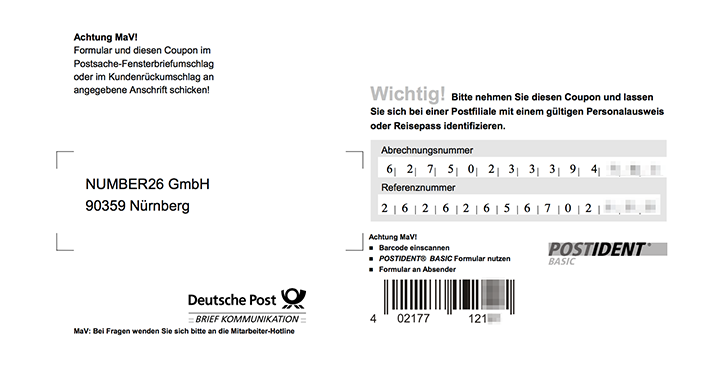 Bring the coupon, your ID proof, and residency proof to your nearest German post office. Third party parcel shops generally don’t provide the PostIdent service, so you should seek out an official Deutsche Post office. The service is free of charge. 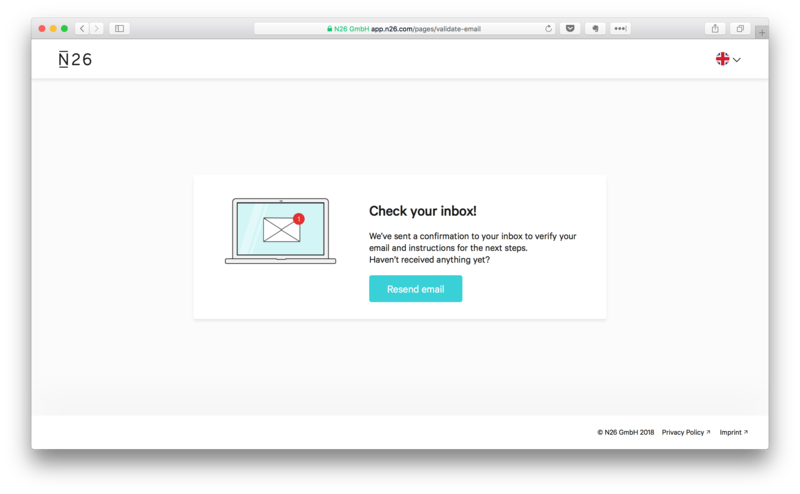 Wait a day or two until you receive an email from N26 about your account being ready. The final step to activating your account is to pair your smartphone. Just download the N26 app and log in (if you haven’t already). Since your account isn’t yet paired with a phone, you will be guided through the steps when you open the app. Make sure the number you entered during the activation is correct and click confirm. You then receive a four digit verification code via SMS and enter it in the app. If you need to change the number you registered with, just contact N26 support and they will help you out. Once you have paired your smartphone, you can use it to verify transactions such as SEPA transfers, Moneybeam, activating your Mastercard or Maestro card, and a few other things. You can actually start using your account right away, even before you receive your Mastercard in the mail. To do that, you simply need to add some money to your account. There’s no limit to the amount of money you can add to your N26 account. It’s a real bank account. And the first €100,000 of your balance is protected by the German Deposit Protection Scheme. While you don’t need to do so to activate your account, I recommend transferring at least a small amount of money to your N26 account right away, so you can start using your N26 card as soon as you receive it in the mail. And you can always transfer the money out of the account again at a later date, without any limits or costs, if you change your mind. That’s it! Look out for your shiny new N26 Mastercard in the mail! 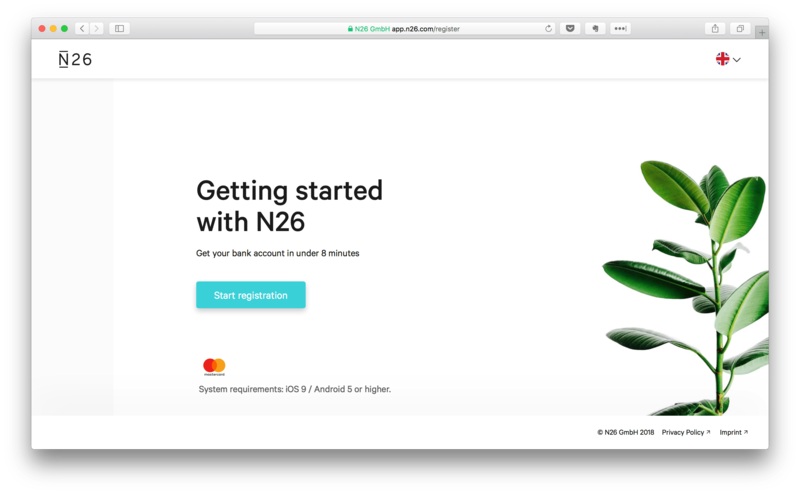 Open your N26 account right now—you won’t regret it!